ISLAMABAD, Aug 20 (APP): Secretary General Organization of Islamic Cooperation (OIC) Iyad Ameen Madani Saturday voiced serious concern over the ongoing gross human rights violations and unabated carnage in the Indian Occupied Kashmir (IOK) and renewed pledge to resolve the issue through peaceful means. 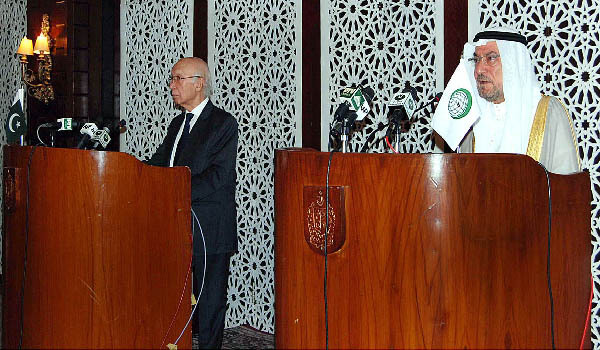 Addressing a joint press stake-out along with Advisor to the Prime Minister on Foreign Affairs Sartaj Aziz, he said the OIC would continue exposing the grave human rights violations in the occupied valley till resolution of the issue in accordance with the United Nations Resolutions and wishes of the Kashmiri people. The OIC general secretary also renewed support to the right of self-determination for Kashmiri people and said that it was an international and legitimate issue. He admitted that mere issuing statements over the very serious situation in IOK was not sufficient by the world bodies and reiterated a political situation to the worsening issue. “The international community has the role to play in this regard,” he said, adding the world must realize that human rights violations should be addressed promptly. The OIC general secretary has been on an official visit to Pakistan. Narrating the ordeals of the Kashmiri people in the IOK, he said violence and aggression continued besides, there was a complete media black-out. He expressed the hope that a comprehensive dialogue between India and Pakistan would take place to address the core issues. Advisor to the PM on Foreign Affairs Sartaj Aziz condemned the use of lethal force by the Indian occupation forces in the IOK against the defenseless Kashmiris, who were protesting peacefully over extrajudicial killings, terming it ‘deplorable’. In the last 40 days, more than 80 Kashmiris were martyred, 6,000 injured and over a hundred have lost their eyesight due to pellet guns firing, he added. The advisor thanked the OIC for consistently supporting Pakistan’s stance over the issue. “Peaceful resolution of the Jammu and Kashmir dispute, in accordance with the UN Security Council resolutions, which is in line with the aspirations of the people of Jammu and Kashmir, is an imperative for the regional peace and stability,” he stressed. Sartaj said the OIC Contact Group on Kashmir would be meeting again in September 2016, during the General Assembly Session in New York in the face of the gross violations of human rights in IOK. Apprising the mediamen about his meeting with the OIC general secretary, he said that they exchanged views on further enhancing cooperation between Pakistan and OIC on the matters of interest to the Muslim Ummah. He also briefed the OIC general secretary on the regional situation, specially the current situation in the Indian Occupied Kashmir (IOK). Iyad Ameen Madani was also told about Pakistan’s desire of lasting peace in Afghanistan and the important role of OIC in support of peace efforts in Afghanistan. “We both stressed the need of intensifying cooperation among the OIC countries and constructive exchange of ideas to address the increasing trends of Islamophobia and defamation of religions. We also agree that the platform of the OIC must be used to build a narrative against extremism and terrorism,” he added. Sartaj said Pakistan as a founding member of the OIC, had always contributed towards strengthening the bonds of fraternity and solidarity among the Muslim countries. “We remain committed to working with the OIC for advancing all the legitimate causes of the Muslim Ummah, including the right of self-determination of the peoples of Palestine and Jammu and Kashmir,” he added. Responding to a query, Advisor to the PM on Foreign Affairs Sartaj Aziz said that they should wait for a response from Indian side after a letter was handed over to the Indian High Commissioner, extending an invitation to the Indian foreign secretary to visit Islamabad by the end of this month to discuss the Kashmir dispute. To another question he said, the UN general secretary Ban Ki-moon had offered to facilitate the dialogue if requested by both sides. OIC General Secretary Iyad Ameen Madani to a query, replied that Muslim countries were sovereign and could take their individual decisions. Lauding the role played by Pakistan as the founding member, he also dropped a hint that OIC would be soon holding its meeting in Pakistan, being a successful host to many international conferences. He said his visit also meant as preparation for the upcoming meeting of the OIC Council of Foreign Ministers in October this year to be held in Tashkent, Uzbekistan. About the issue of Afghanistan, he said OIC was also organizing Ulema Conference for a prosperous, peaceful and united Afghanistan and expressed his gratitude to Pakistan for its support in this regard. Responding to a question about Palestine, Madani said that the OIC had been in the forefronts to resolve the issue. He informed that the OIC representative office was opened in Ramallah and expressed the hope that soon there would be a stable unity government in Palestine.